There’s a new “Own It” ADHD PSA featuring Adam Levine and the interwebs are all abuzz about it, so I thought I’d scope things out. The Us Weekly article I found says the PSA went live yesterday at ownyouradhd.com. Anyway, I don’t know enough about Mr. Levine to have a real opinion about whether or not he has ADHD, but I don’t really think it’s my place to decide. I only say that because there are a lot of people out there complaining that he’s just blaming his immaturity on ADHD. I’m not one to judge others (or at least I try not to), so I’m going to give him the benefit of the doubt and say he’s doing a good thing. Either way, I thought the screening quiz might be worth sharing on here. A lot of people ask how to go about getting diagnosed with ADHD. Answering this quiz’s six questions alone can’t indicate an actual diagnosis. But it’s quick and easy…and it will at least give you a general idea of whether or not you might potentially be a fellow ADHDer. I remember when I first started seriously researching ADHD, before I was diagnosed…while I was finally acknowledging it as a possible diagnosis. 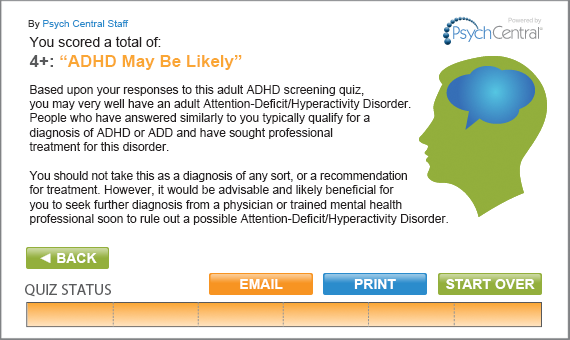 I took a few of these online screening tests and all my results pretty much (aka very clearly) pointed to ADHD. In a way, the quizzes seemed silly. 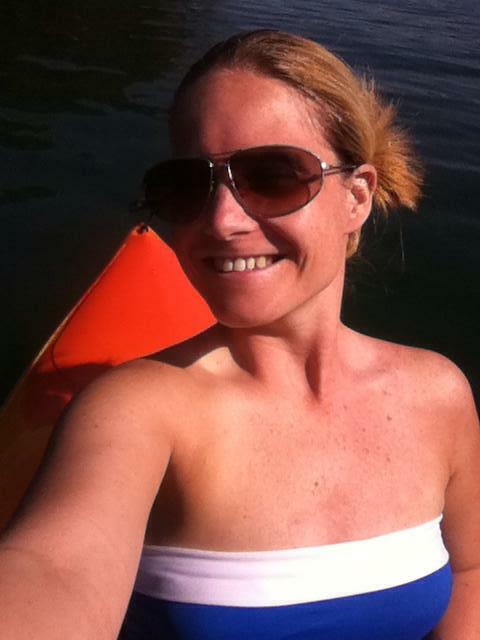 The questions were so simple and, with each answer, I knew I was answering the ADHD way. I guess I kind of felt like everybody else must be answering them that way, too. Then some of my friends gently let me know that their answers were not so ADHD like mine. That made me realize I might actually have it. In a way, the quizzes gave me a push…a confirmation of sorts…that helped give me the courage to actually go get help. I mean, when you get, “ADHD May Be Likely,” or, “You scored 19 points, which corresponds with less than 1 percent of the people who took the quiz…” yeah, ADHD just may be likely…damn highly likely. There are a lot of other online quizzes or screenings out there, if you need more convincing (either way). The questions they ask are pretty similar and based around the DSM diagnostic criteria. Here are the links to a few others, to get you started.